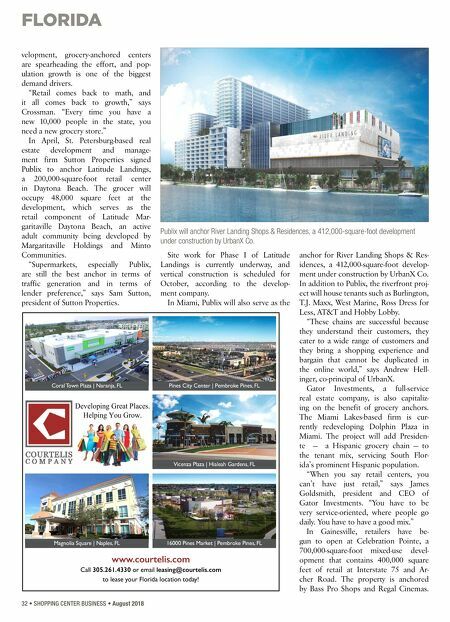 FLORIDA 32 • SHOPPING CENTER BUSINESS • August 2018 velopment, grocery-anchored centers are spearheading the effort, and pop- ulation growth is one of the biggest demand drivers. "Retail comes back to math, and it all comes back to growth," says Crossman. "Every time you have a new 10,000 people in the state, you need a new grocery store." In April, St. Petersburg-based real estate development and manage- ment firm Sutton Properties signed Publix to anchor Latitude Landings, a 200,000-square-foot retail center in Daytona Beach. The grocer will occupy 48,000 square feet at the development, which serves as the retail component of Latitude Mar- garitaville Daytona Beach, an active adult community being developed by Margaritaville Holdings and Minto Communities. "Supermarkets, especially Publix, are still the best anchor in terms of traffic generation and in terms of lender preference," says Sam Sutton, president of Sutton Properties. Site work for Phase I of Latitude Landings is currently underway, and vertical construction is scheduled for October, according to the develop- ment company. In Miami, Publix will also serve as the anchor for River Landing Shops & Res- idences, a 412,000-square-foot develop- ment under construction by UrbanX Co. In addition to Publix, the riverfront proj- ect will house tenants such as Burlington, T.J. Maxx, West Marine, Ross Dress for Less, AT&T and Hobby Lobby. "These chains are successful because they understand their customers, they cater to a wide range of customers and they bring a shopping experience and bargain that cannot be duplicated in the online world," says Andrew Hell- inger, co-principal of UrbanX. Gator Investments, a full-service real estate company, is also capitaliz- ing on the benefit of grocery anchors. The Miami Lakes-based firm is cur- rently redeveloping Dolphin Plaza in Miami. The project will add Presiden- te — a Hispanic grocery chain — to the tenant mix, servicing South Flor- ida's prominent Hispanic population. "When you say retail centers, you can't have just retail," says James Goldsmith, president and CEO of Gator Investments. "You have to be very service-oriented, where people go daily. You have to have a good mix." In Gainesville, retailers have be- gun to open at Celebration Pointe, a 700,000-square-foot mixed-use devel- opment that contains 400,000 square feet of retail at Interstate 75 and Ar- cher Road. The property is anchored by Bass Pro Shops and Regal Cinemas. 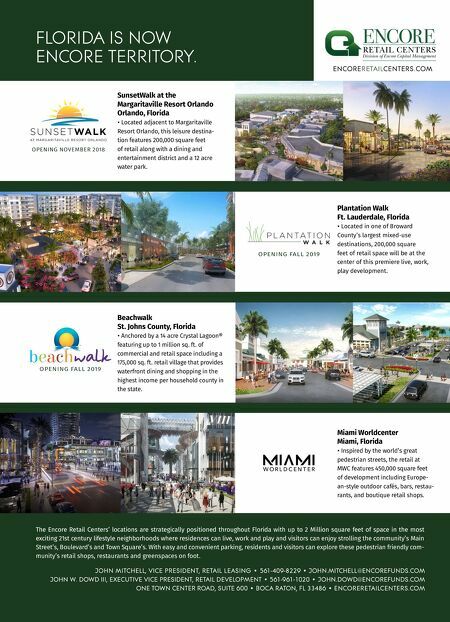 Publix will anchor River Landing Shops & Residences, a 412,000-square-foot development under construction by UrbanX Co. Coral Town Plaza | Naranja, FL Pines City Center | Pembroke Pines, FL Magnolia Square | Naples, FL 16000 Pines Market | Pembroke Pines, FL Vicenza Plaza | Hialeah Gardens, FL www.courtelis.com Call 305.261.4330 or email leasing@courtelis.com to lease your Florida location today! Developing Great Places. Helping You Grow.